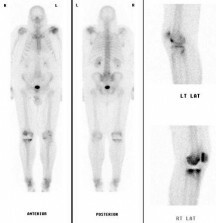 Bath Radiology Group offer the full range of nuclear medicine diagnostic investigations. Both Richard Graham and Stewart Redman are subspecialized radionuclide radiologists and hold full diagnostic licenses from the Administration of Radioactive Substances Advisory Committee (ARSAC). 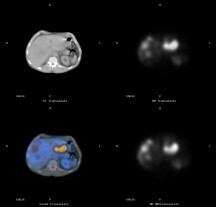 In addition Richard Graham holds an ARSAC license for PET-CT. Since the studies are reported by radionuclide radiologists, the report produced considers both the functional (nuclear medicine) and the structural (plain film, CT and MRI) information to produce an integrated clinically useful report. 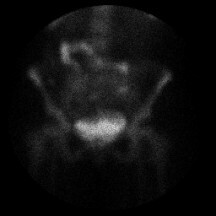 We utilize single photo emission computed tomography (SPECT), and CT co-registration, for a large proportion of our studies, which produces cross sectional images that give us increased diagnostic certainty. Staging and re-staging of carcinomas with possible skeletal metastases e.g, prostate, breast and lung. 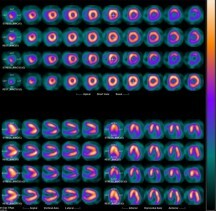 V/Q scanning has a very high negative predictive value in the investigation of pulmonary embolic disease. We perform studies in the investigation of acute and chronic disease. All our V/Q scans are performed using SPECT. We recommend ‘half dose’ Q scanning in pregnant women as the patient breast dose is significantly less than that of CTPA. DMSA renogram for imaging renal scars and calculating split function. We perform labeled white cell scans for osteomyelitis and occult infection. We generally will perform a bone marrow scan contemporaneously to increase the usefulness of a white cell scan. We perform lymphoscintigraphy to localize sentinel lymph nodes. 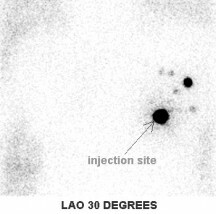 Dacroscintigraphy for the investigation of epiphoria. We are always happy to discuss the potential usefulness of a nuclear medicine investigation with any referring clinician.